It’s an album that does exactly what the band expect, it transports you back to the early 2000s and makes you fall in love with the band all over again. With it being 5 years since their last material and band members being involved in other projects people thought Alkaline Trio were dead, with this album it’s obvious there’s plenty of life in the old dog. 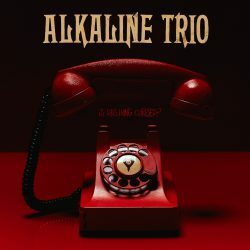 Vibrant and highly enjoyable through all 13 tracks, there’s all the normal Alkaline Trio markers in abundance – hooks, dual vocals, gothic tales and insatiable amounts of pop punk. Title track and opener ‘Is This Thing Cursed?’ has had plenty of play being the lead single and provides an immediate slab of dynamic pop punk. ‘Blackbird’ was the first single, so the driving pop punk and big chorus should come as no surprise, hell you can still appreciate it for the great track it is. It’s down to ‘Demon and Division’ to be many people’s first real taste of brand new Alkaline Trio material and you’ve got every right to be excited. The bass intro is delectable before Matt Skiba’s vocal drives in to make for one of 2018s most immediate tracks. Adriano comes in with that smooth vocal halfway through to make it even better. ‘Little Help’ rolls the years back in a fast-paced punk rock track that makes you breakout in a huge smile – this is the kind of thing that made us fall in love with Alkaline Trio all those years ago. ‘I Can’t Believe’ dusts off more cobwebs before ‘Sweet Vampires’ acts as the typical Alkaline Trio track – just brilliant. ‘Pale Blue Ribbon’ is a short and fast pop-punk track full of energy, emotion and attitude while ‘Goodbye Fire Island’ has an emo-punk feel with a driving riff and hook that begs repeated listens. ‘Stay’ has a slower Americana-punk feel with Adriano’s vocal playing centre stage making for a track full of emotion and lament. ‘Heart Attacks’ is a grower – on first listen it doesn’t standout, by your fourth or fifth listen (of the album) it becomes a favourite with it’s spikey riffs, pace and dual vocal. ‘Warn So Thin’ is overflowing with riotous punk energy before ‘Throw Me To The Lions’ plays a masterclass in what Alkaline Trio are all about – that chorus and hook couldn’t be any better. Closer ‘Krystaline’ with its acoustic backdrop and emotional lament is the perfect finish to a wonderful return.